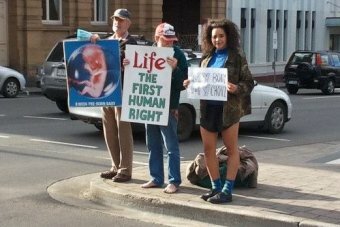 The High Court has ruled laws in Victoria and Tasmania prohibiting anti-abortion protests near clinics are valid. Two people prosecuted in Victoria and Tasmania told the High Court they had been denied their right to freedom of political communication. Mr Preston was found to have been within the no protest zone, carrying placards reading “Every child has the right to life” and “Everyone has the right to life”. Today the High Court dismissed the appeals, saying the laws served a legitimate purpose. The court considered two similar cases from both states. The pair both said they had been denied their right to freedom of political communication and the laws were unconstitutional. All states and the Northern Territory also intervened in the case, pointing out that even if the implied freedom had been affected, it was outweighed by the necessity to protect women seeking a termination. Victoria, Tasmania, New South Wales, the ACT and the NT all have similar laws banning protests within 150 meters of clinics. Victoria’s law only prohibits activities likely to cause distress and anxiety to people seeking an abortion.